Italy and AC Milan striker Antonio Cassano has apologised after reportedly saying he hoped there were no gay players in the national squad. The comments, which are sure to spark controversy, came after reports in the national media that two players in the Italian squad were homosexuals. A hastily written statement issued on the official website of the Italian Football Federation last night clarified the Italian talisman's views. It said: "I sincerely regret that my statements have sparked controversy and protest from gay rights groups. "Homophobia is a sentiment that is not mine. I did not want to offend anyone and I can not question the sexual freedom of other people. "I only said that it is a problem that does not concern me and it is not for me to pass judgment on the choices of others, who are all respected." The apology came after Cassano responded to questions about reports in Italy which claimed there were two homosexual players in Cesare Prandelli's 23-man Euro 2012 squad. Cassano reportedly said. "If I say what I think...I hope there are none. But if there are queers here, that's their business." In response, the Justin Campaign said: "Once again we see a top footballer making homophobic comments to the media. Once again we see footballing authorities making a hasty u-turn in clarifying the words said to avoid a PR disaster. Once again the world receives an apology. "With such a backdrop is it any wonder why footballers don't openly admit their sexuality? "This is about more than PR management, it is people's lives. Change will not happen overnight. But Cassano's comments are at best unhelpful, at worst homophobic, and football needs a better example set by its figureheads if true equality is to be reached on and off the pitch." Does anyone know the context Cassano said it? Coulda been "This is a terrible era in modern-day football to come out". The benefit of the doubt is rarely administered nowadays! I'm Italian,gay, and play football....I heard and saw the video, which was a bit shocking. Then he came back and there were moments were the general opinion thought he learnt....till he had a very big health problem that could have meant he couldn't play football anymore....it was not the case in the end...he recently came back and he had this massive opportunity to represent Italy (after the controversial previous experiences dictated by his uncontrolled behaviour). - People like to provoke him as it's quite predictable how he would react, as I heard the question I just knew something would have happened! - With no offence I'd say is one of those people that didn't want/couldn't study, can barely put sentences together which are full of grammatical errors. This, together with his personality could only lead to his jokes to become bombs! All in all I believe people like him that represent a nation and that are followed by millions CAN NOT lead to such situations. I'm also quite convinced he didn't bring those silly words with hate or anything, he was just doing what he loves : joke....I don't understand why nobody intervened straight away as the show went on for a while. 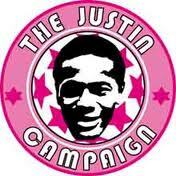 Founded in memory of Justin Fashanu, the only openly gay professional footballer in the UK. Campaigning to challenge and rid homophobia from the beautiful game. Ukraine: a fit and proper place for Euro 2012? Have you encountered homophobic abuse while watching football?